We use low- and mid-latitude zonal ion drift observations from the DE-2 satellite and auroral electrojet indices to study the temporal and latitudinal variations of F-region perturbation drifts during magnetically disturbed conditions. These perturbation drifts are driven by magnetospheric and ionospheric disturbance dynamo electric fields with time constants from less than one to several hours. We determine, initially, the drift patterns due to the prompt penetration of magnetospheric electric fields and of longer lasting disturbances. In this study, we concentrate on the properties of the longer lasting perturbations which occur with latitude-dependent time delays after enhancements in the high-latitude ionospheric currents. These perturbation drifts are predominantly westward at all latitudes with largest amplitudes in the midnight sector and smallest near noon. The daily variation of these disturbance drifts derived from the satellite data is in good agreement with results from incoherent scatter radar observations. Our results indicate that these longer lasting perturbations are due to the combined effects of ionospheric disturbance dynamo electric fields and leakage of high-latitude steady-state electric fields to lower latitudes. 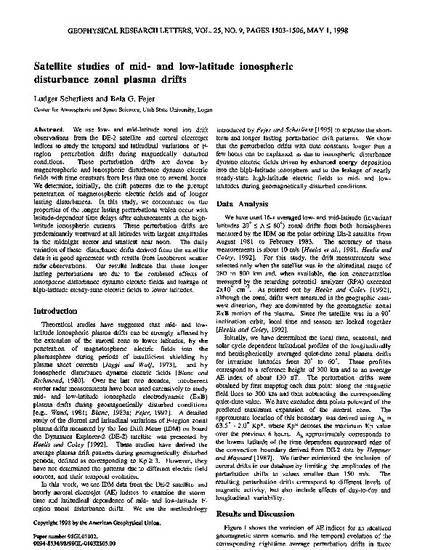 Scherliess, L., and B. G. Fejer, Satellite studies of mid- and low-latitude ionospheric disturbance zonal plasma drifts, Geophys. Res. Lett., 25, 1503, 1998.